The Celtic goddess of rivers and poets was Boanne. 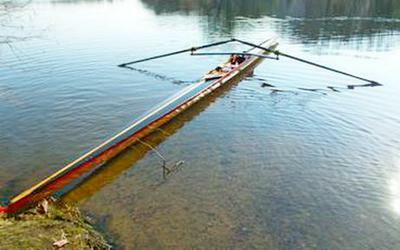 I set out to build a single scull that drew from both the classic material of wood and the modern materials of epoxy and carbon fiber. I also wanted it to be rigged with a modern wing rigger which would allow me to forego the internal ribs needed to support conventional side mounted riggers. 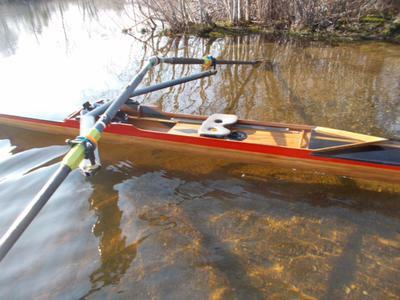 The body plan was drawn by Graham King a well known designer of racing sculls and I built her in my basement. She is 1/8 inch red cedar strips laid up over a series of molds set 1/2 meter apart. At 27' long all the strips had to be scarfed together using a 1to 12 scarf joint cut on a table saw. To saturate the fabric after the strips were in place I covered the outside in one layer of 2 oz glass set in System three laminating epoxy. I like the system 3 clear coat better than West epoxy because there is no amine blush and it is thinner to saturate the glass . I reinforced the stress areas with another layer of 2 oz glass on the outside. Inside I added diagional layups of carbon fiber tape set in epoxy vacumm bagged in place. Prior to the deck and rigging the whole 27 ft boat weighed 17 pounds. I decked her fore and aft with a laid up composite made of honeycomb nomax and 2 oz glass all set in epoxy and vacumm bagged. The center cedar strip on the deck is the only bit of pure ornamentation I indulged myself in. The boat is rigged with a Rowfit wing rigger, a wonderful company in Australia, the seat and slides are from Carl Douglas in England and the oarlocks and sculls are from Concept 2 in Vermont. I could not have built this boat 20 years ago before the internet allowed people like me to source equipment and fittings from the whole globe rather than what was available locally. I have owned her for about 8 years now and she goes out over about 80 times a year. I have had to do some repairs and she is not as stiff as she was when I first launched her but she is a great boat. When I get in her it is more like putting on a comfortable suit of clothes rather than getting into a boat. On a really good row I feel that Boanne is an extension of my body or perhaps I am a part of her. And that is the best reason for building your own boat in wood, by doing that you create something alive, for a wooden boat unlike a plastic one has a soul. And if you can create something with a soul that is beautiful you are one with the gods. 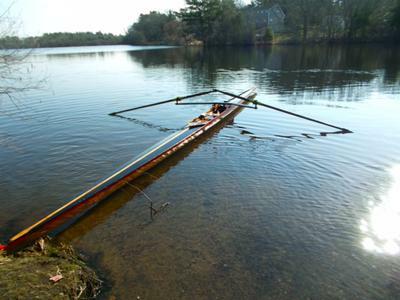 Comments for Single scull "Boanne"
Is there any way to purchase a set of plans?